Active full length recombinant human N-terminal His tagged MeCP2 (Methyl CpG Binding Protein 2) protein, produced in SF9 insect cells. MeCP2 (UniProt/Swiss-Prot entry P51608) is a chromosomal protein with abundant binding sites in the chromatin. It belongs to the family of methyl CpG binding proteins which also comprises MBD1, MBD2, MBD3 and MBD4. MeCP2 can bind specifically to methylated promoters, thereby repressing transcription. This transcriptional repression is mediated through interaction with histone deacetylase and the corepressor SIN3A. MeCP2 also is essential for development. Mutations in MeCP2 are the cause of several types of mental retardation including Rett syndrome, a progressive neurological disorder that causes mental retardation in females and mental retardation syndromic X-linked type 13, and may also be involved in Angelman syndrome and susceptibility to some types of autism. MeCP2 activity assay. A 70 bp methylated DNA (50 ng) was incubated with increasing amounts of MeCP2 (lane 2 - 4) at room temperature for 30 min and immediately analyzed on a native polyacrylamide gel. A negative control (no addition of MeCP2) is shown in lane 1. 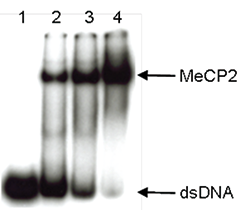 Diagenode strongly recommends using this:	Recombinant human MeCp2 (Diagenode Cat# C23010106). Click here to copy to clipboard.